TINY TURBODIESEL: Thanks to technology partners from Germany and American, Tata’s Nano will soon sport the world’s smallest volume production turbodiesel engine. The Tata Nano, famous for being the world’s cheapest car when introduced back in 2009, has gained notoriety in the last few months for a sudden inflation in price and fire safety concerns. Sales of "the world’s cheapest" car shrank to only 500 in India during November 2010 but an intervention by Tata involving financing and maintenance plan incentives swelled sales to 6000 for the last month of that year. Despite vacillating market demand for its smallest auto product, Tata is surging ahead with its range expansion to include diesel and electric models in the near future – partly also to address the issue of softening sales. Tata’s Nano CRDi will be a sub one-litre car to be produced as a joint venture with Bosch and Honeywell. It will be one of the world’s smallest turbodiesel production engines. Although final capacity is to be confirmed, a swept volume of between 600 and 700cc is expected. With Bosch common-rail injection (the smallest high-pressure diesel delivery system yet developed for a vehicle) and a Honeywell turbocharger, the Nano CRDi should offer class-leading power and efficiency in the sub one-litre supermini class. 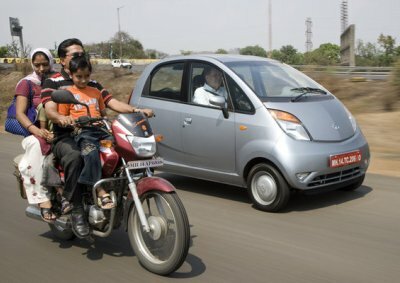 The Nano CRDi is expected to be available to Indian buyers by the third quarter of 2011.